The Toshiba Satellite Pro P100 is an excellent multi-media desktop replacement laptop. It sports many innovative features which will immediately convert many users into admiring fans. However, like any object of our affections, the Satellite P100 does have some flaws. A close examination of all the features and flaws of the Toshiba Pro100 will give you some indication if this is the laptop for you, especially if you're in the market for a PC desktop replacement. 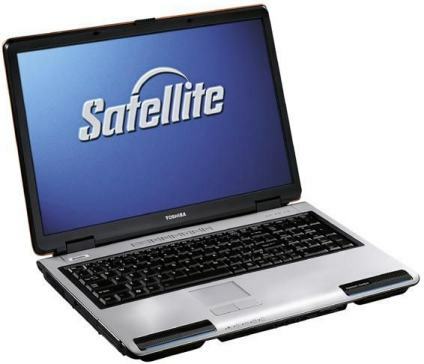 The Satellite Pro100 laptop was recently introduced by Toshiba to compete in the lucrative PC marketplace. If you can fit all the performance and features of a full size PC into a laptop, why not go for a smaller sexier package? Has Toshiba succeeded in producing a better desktop PC? Enquiring minds want to know! Lets give the Toshiba P100 a closer look and point out all the pluses and minuses, the pros and cons of this new multi-media desktop replacement powerhouse. Lets consider the Pluses first. There's no denying it, the Toshiba Satellite P100 looks good. This laptop has style. It lives up to its name - Professional. 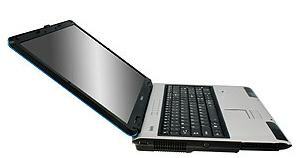 The Toshiba Satellite P100 is black with a matte silver interior off-set with a black keyboard. The design is sleek, simple and clean. Everything fits. Quite frankly, in the looks department, it has to be rated a 10 or very close to it. Now everyone knows a laptop's looks should not be your first consideration when buying a laptop, but from a marketing angle this factor may play a bigger role than all the impressive specs and technical performance this laptop possesses. In today's world, looks and style does count; don't let anyone try to convince you otherwise. Besides, this classy laptop package will be displayed prominently in your home or office - its impressive looks will turn a lot more heads than your run-of-the-mill PC. Sporting the new Intel Core Duo T2400 1.83GHz processor on a 100GB SATA (5400 RPM) hard drive with a 667MHz FSB or System Bus. The Satellite P100 is pre-loaded with 1 Gig of RAM (expandable to 4 Gigs). You probably already know RAM is one of the main factor in determining the speed of your computer. 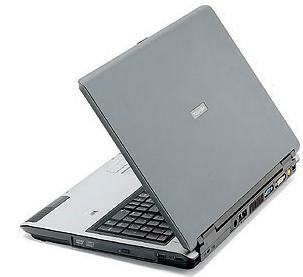 Plus, with a 128MB NVIDIA GeForce Go 7300 graphics card this laptop will easily handle all business applications and will even handle many of the older games... but please note you may need to upgrade to a 'gamer-centric' model, such as the Toshiba Satellite P105-S921 with NVIDIA GeForce Go 7900 GS for playing all the latest games. The NVIDIA's GeForce Go 7300 video processor has 128 MB of dedicated memory and can 'borrow' extra memory from the system's RAM with Turbo Cache. Up to 512 MB of total video memory. This laptop offers top performance. The new Intel dual core processor makes simultaneous multi-tasking quick and painless. Double your power. It can process multiple applications, and carry out some of the most demanding multi-threaded programs. It is also Windows Vista compatible for those who are thinking ahead. The Toshiba P100 does offer more than enough performance to easily handle all the chores and tasks of a regular PC. In many cases, it will out perform many current PCs. This laptop runs cool and quiet. The Satellite P100 runs very cool - for the first week or so I placed this laptop on a thin plastic tablecloth, just to check if there would be any overheating. None. Good underbody ventilation. This laptop is also very quiet - there is only the occasional whir from the fans. Like a high price auto gearing up - well not really, but you won't mind the sound. This laptop offers great viewing pleasure. Featuring a 17 inch LCD Widescreen TruBrite display that's crisp and clear, the visuals on this Toshiba laptop holds up against many higher priced laptops. Toshiba is known for its high quality screens and this laptop's display is no different. The images are sharp and the colors are brilliant. Native resolution for the display is 1440 x 900 pixels. And the screen is clear and viewable from all angles. Watching DVDs and Videos on this laptop may become addictive. I was frankly surprised at the excellent viewing graphics and sound. The widescreen makes watching 16:9 ratio aspect movies more enjoyable and because you're sitting close to the laptop, you get surprising good visuals. The 100 Gig hard drive and the DVD Super-Multi Drive for burning DVDs will come in handy for fully enjoying all those movie downloads. The dual layer DVD burner which burns DVD-R or DVD+R discs at a maximum of 8x. The Toshiba P100 also comes pre-loaded with the InterVideo WinDVD Creator 2 Platinum and Sonic Record Now. This laptop has perfect sound. Perhaps, what makes the viewing experience so enjoyable are the built-in Harman/Kardon stereo speakers. On most laptops you get horrible sound, this is not the case here. This P100 has Intel High Definition Audio sound chip and Toshiba has boosted this system with integrated speakers, using top-of-line Harmon/Kardon speakers. You also have headphone jack for private viewing. If you enjoy using your laptop or computer for watching videos/movies than the great sound on the Satellite P100 should play a major factor in your buying decision. This laptop has a nice touch and feel to it. That might sound frivolous, but after using the Toshiba Satellite for two or three weeks you really do appreciate how comfortable and how effective the overall design of this laptop truly is. Typing is a breeze and the touchpad is responsive. The three programmable shortcuts on the touchpad is a unique feature that will save you a lot of time. The full size number keypad is convenient for many business applications and almost justifies the rather cramped keyboard, some of the other keys have been downsized. Especially the small right shift key and a slightly smaller enter key. However, it must be added, after one uses this laptop for a week or so - these smaller keys are not a factor. You quickly adjust your typing and the differences become insignificant. Other features of the Toshiba P100 include 10/100/1000 Integrated Ethernet LAN and Intel Wireless LAN 802.11abg for networking. Card slots include 1 PC Card Slot Supports One Type II PC Cards, 1 Express Card Slot Supports CardBus. Ports include 4 x USB 2.0, RJ11, RJ45, Headphone Port, External Microphone Port, S-Video Out, RGB, DVI, and S/P DIF. Now, lets consider some of the minuses. This laptop is not portable. At little under 8 pounds you won't be lugging this laptop around on many trips. It really is not designed as a lightweight portable notebook but as far as desktop replacements go - the Toshiba P100 is easy to carry around the house. It does not feel or look bulky. This Laptop has poor battery life. It has to be realized, in most big powerful multi-media desktop replacement you will get poor battery life. The battery life on the Satellite P100 is around 2 hrs with the 6 cell battery. Since most owners use this laptop for a desktop replacement, long battery life is not that important. They will mainly be using this laptop plugged in to AC power. After you have used this media-media laptop for three or four weeks many of its high performance and powerful features will surprise you. I have not had a crash or freeze-up yet. And I do a lot of multi-tasking - it is not common for me to have 10 or 15 browser windows open, downloading files, graphics, answering emails... all the while burning off a DVD or deleting files with 35 over-writes, with countless programs running in the background. The Intel Duo Processor does the trick. It lets you handle much more work than an ordinary PC. Keep in mind, the Toshiba Satellite does have some flaws, there is poor battery life and at around 8 pounds this is not a portable laptop. A truncated keyboard. It also has no built-in web cam which would have been a nice addition in a laptop of this caliber. However, the major selling point must be the great crisp 17 inch screen with superb visuals and excellent sound from the Harman/Kardon speakers. Forget all the specs and techno features, this laptop is a pleasure to use and enjoy. Whether you buy the Satelitte P100 for your home or office - this laptop won't disappoint. It has a comfortable keyboard, more than enough performance for complex multi-tasking chores and a display that won't put a strain on your eyes no matter what you're watching. The Satellite Pro is a powerful PC replacement that offers great visuals and sound. The Intel Duo Processor will easily handle almost any applications that you can throw at it. The Toshiba P100 does make a great desktop replacement for your old PC. It is worth your consideration. Did we mention it also looks great! This article was supplied to us by a guest writer, here's some more info about Titus Hoskins: The author runs an online Laptop Guide featuring the latest top gaming laptops. For Timely Special Savings/Deals/Coupons on Toshiba, Dell, Apple, Sony, Alienware...click here: Cheap Laptops. p100 is really a trash...for an expensive amount it doesn't worth it we paid 2700 euro on it the warranty period is too short on ly 1 year. so from this we've learned alot. never buy expensive thing expecially toshiba coz it's useless. we've only use it for 2 years and now it's dead.....WHAT A WASTE OF MONEY. next time we'll just buy cheap one atleast if it breaks no hurt feeling coz it don't cost a fortune. and thoshiba don't give a damn on the problem coz the said you should buy the extra warranty werein will cost you more. OK, used it for video editing for a year and a half. It was amazing! Fast, quiet and the screen looked really good. then it started. it woudl go to sleep and not wake up. One day it never woke up. turns out the graphics device went on it. Now it's a paper weight. Had it a year and while not as ruggedly constructed as my previous five Toshiba laptops works great and was great...until this morning when I noticed a stress fracture on the lid by one of the hinges. Toshiba have definately downgraded their quality to compete in the mass market, the fuckers. Off to buy a macbook to compliment my iMac I bought 6 months ago! I have this laptop and it`s far from rubbish.Runs tons of applications effortlessly, plays games like Far Cry on full settings, looks stunning and mine has no cracks on it anywhere. It`s an impressive piece of kit that has surpassed all my expectations.I got the one with the Go 7000 graphics card, which plays flight simulator X very well indeed.If you want a laptop instead of a p.c. tower, then you could do a lot worse than this! I bought the p100 16 months ago. The 3 deciding factors where performance ability, number pad on the side, and 17 inch screen. Big disappointments have been the keyboard that often misses my key strokes when speed typing. Hard drive bottle neck of data. What got me looking on-line is seeing about a stress fracture that has appeared by one hinge, this is not covered under warranty but seems to be a common design flaw. Not wanting to fix the problem had me disappointed with Toshiba Canada's level of support and after this I will be filing a complaint with the BBB. dont waste your money on this, i have this laptop, i have had it for one year, it has never been abused in any way. i had to replace motherobard,keyboard,charging cable twice, and now when the usb drive doesnt work, and the shift key makes a NB-A when i press it, and toshiba's so called support is garbage. i sent it to them, and they said it was fixed sent it back, and it didnt change at all. Well, 15 months ago I bought this laptop. (the Dell site was down the day I was ready to buy). Within two weeks the hard drive gave out. I was impressed with the turnaround time for repairs (less than a week mailing it in)but not impressed with the packing (just tossed into a box loose with nothing to hold it. Scratched up the top The unit did over heat once when I closed the top to put it into hybernation and when I put it into the bag, it turned back on. partly melted the COA on the bottom by the time I got to work. Found that sneezing in the same room would take it out of hybernation. great! The button for popping out the PCMCIA card pops out all the time (with out a card in). I Bought this thing with the best video card, best network card (which worked without flaw) 2 gigs of ram (which needed a patch to windows that the company didn't do) and the fastest hard drive they had along with 2.0 processors. Truth be told, my desktop unit is just as fast with 512 megs ram (granted it's rambuss), an average hard drive, and single 2.4 pentium4 processor. Paid $2, 500 for the whole laptop sebang and got 1.25 years out of it (with problems). Think I'll check to see if the Dell site is running. i have the toshiba with vista on and its sollid! but in all they are solid laptops its only some that are poor. I have owned this P100 for over a year. Straight out of the box the motherboard had to be replaced. There have other operational issues. Warranty & support have been useless. Now I am developing stress fractures at the hinges. Toshiba says it is physical damage and not included in my extended warranty. They suggested I take it to the closest warranty station...3.5 hours away. I brought to there attention the "Hinge Remediation Program" on the predecessor line of laptops that they are only now addressing. See: www.satelliteremediationprogram.com The guy handed me off to customer service......after sitting on hold for 30 minutes I gave up. "Peace offering" from Toshiba after my monster 17" laptop died after 2 years. When I first received this unit, the FIRST thing I noticed was the screen. It's dark as hell, and mine has bright spots on it (as though someone pushed the screen with their finger) straight out of the box. The sound on this unit is tinny, quiet, and leaves a LOT to be desired. The hard drive in this unit is a SERIOUS bottleneck. I'm looking to replace it, but so far, I'm not sure if it's the controller or the physical drive. All I know is that the disk thrashing goes on ALL THE TIME!!! If you're considering killing vista on it (as I did), you'll find a lot of things aren’t supported, and even Toshiba will refuse to provide support. The first upgrades I'm doing to this box are going to the HDD, RAM (one Gb isn't enough for photo editing or general messing around), and then the processor. This 1.8 is slow, and doesn’t seem to provide the same performance of my SINGLE CORE 2.4 in my desktop with HALF the RAM!!!! Think twice before buying this unit. I can't say much considering I got this one for free. I've considered selling it and buying a REAL laptop. You can't pay me enough to take another Toshiba. I would suggest the poor battery life solution as using external laptop battery. I bought one from electrovaya www.electrovaya.com. PP95 is one the best solution had even seen in my life. Pretty well designed battery with digital gauge and two usb ports for $199. It works for me and may work for you too. Whenever have chance have a look at www.electoraya.com.